More than just a jail! 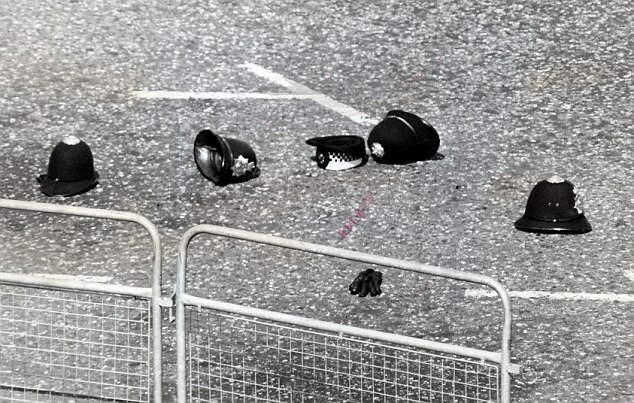 PHOTO SHOWS THE AFTERMATH OF THE MURDER SCENE AND FATAL SHOOTING OF WPC YVONNE FLETCHER WITH HER POLICE HAT SEEN HERE IN AND AMONGST SOME OF HER COLLEAGUES POLICE HELMETS. Once you enter the jail, through where the old courthouse once stood (sadly demolished and ripped_out by its previous owners back in 1986) you will come face to face with an extraordinary Aladdin's Cave of curiosities. This eclectic private collection touches on a great many sad, disturbing, quirky and at times taboo subject matters - so again be warned!!! It is an intriguing collection which includes a great many rare and historically significant exhibit items including the hangman’s noose that was used on the man they couldn't hang - John 'Babbacombe' Lee. The skull remains of the last man in Britain to be gibbetted, then hung, drawn and quartered and touching closer to more modern times, you'll find the tools and belongings of Gloucestershire’s infamous serial killers... Fred and Rose West on display. "Yes, it's bizarre, macabre, disturbing, hard-hitting and ‘in-your-face’ in places. It's also a bit titillating here and there... at times ‘tongue in cheek’... but there’s also a light hearted bit of banter in the way some of the collection is presented. I'm sure that once you have seen all that is here you will agree that it's certainly different, unique and well worth the visit ???"